It's like ... it's like ... like finding out that Superman ... no, make that the Green Lantern ... no wait, make that Aquaman ... it's sort of like finding out that Aquaman is just good at holding his breath under water, and that fish don't really do what he says. Actually, it's more like finding out that Richard M. Stallman founded the GNU project in 1983 and wrote the GPL (as well as Emacs, the original gcc, and a few other things). Since 1983, mostly he's just gone around collecting honorary doctorates, giving talks at which he yells at people for saying "Linux" instead of "GNU/Linux." And promising the HURD kernel which even more a piece of vaporware than Duke Nuk'em Forever. And he seriously needs a haircut. Actually, for the most part I agree with Stallman's ideas, but I once wrote him an email thanking him for starting GNU and asking him a question. I got back a form letter asking for money (not for him, for various causes, some of which I don't agree with) and no answer to my question. It was pretty obvious that he hadn't read the email. I don't care about that, but to get back a request for donations instead of an answer is kind of tacky. As far as Eric S. Raymond is concerned, he's just another self-proclaimed guru. It's usually not a good idea to pay attention to such people. A good example is John Gray. If you don't know who that is, you'll recognize the titles of his books. Here's a link: http://en.wikipedia.org/wiki/John_Gray_(U.S._author). Take a look at the part under "Credentials." Well, to be fair, RMS was and still is a more important figure in the FLOSS movement, and indeed in software in general, than ESR. His management role in FSF is genuine, and important, even if he doesn't write a lot of software these days. However, the unsolicited request for donations was pretty LOL of him. I'm currently a junior at the University of Buffalo studying MIS and math. I figured that bragging, exaggerating and self-promoting my way to fame might be pretty cool, so I am now seeking out expert advice. How best can I alienate people and take credit for things that I didn't really create, or exaggerate my role in undertakings to the point where I make myself seem a key figure? Also: how can I lard everything I say with my caveman-like political bias? ...but he hasn't gotten back to me yet. Also LOL @ John Gray ... in my experience, people who have any real expertise outside of their formal education don't go to diploma mills to validate it. True what you wrote about RMS ... 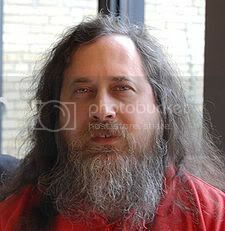 I know it's shallow of me to judge someone by the way he looks, but RMS (in the photo I posted) looks a lot like this homeless dude who hangs out near where I work. He's actually a nice guy. I think he may be mentally ill, though it's hard to tell; some people just have crazy ideas without actually being crazy. One time I was talking to him and he told me that the mirror on the Hubble space telescope was causing global warming. I told him that was unlikely since the mirror on the Hubble is only about two meters across. He said I only believed that because of government disinformation, and that the mirror was actually miles across. Moving right along ... funny email you sent to ESR. A little more about John Gray: the Maharishi Mahesh Yogi that he "studied" under is the same guy who turned the Beatles on to LSD. I don't know if that's good or bad. The White Album probably would have been different. Important, but not mention in the Wikipedia article, is that all of John Gray's ideas were cribbed from a real psychologist named Carol Gilligan (now at Cambridge). Greatest proof that the whole Mars/Venus thing is a scam is the book The Mars & Venus Diet & Exercise Solution. Easy to tell. If there's more of us than them, they're crazy. That's a good point. How do you decide if someone is mentally ill? Just because they have ideas which are outside the mainstream consensus reality? Because they hear voices that nobody else hears? Outside of some pretty obvious structural defect or damage to the brain, I think it's virtually impossible to really know that somebody has a "mental" illness. Everybody I know has at least a few cognitive and/or emotional problems; that's part of being human - and so by definition must be normal for human beings. This isn't to say that we shouldn't try to help people who engage in, e.g. self-destructive behavior. I think we should. But "crazy" is a big label that some people will slap on just about anybody who disagrees with them. "Ich bin a Jelly Doughnut..."
If you go for the 1-1 translation it would mean "I am an Captive"